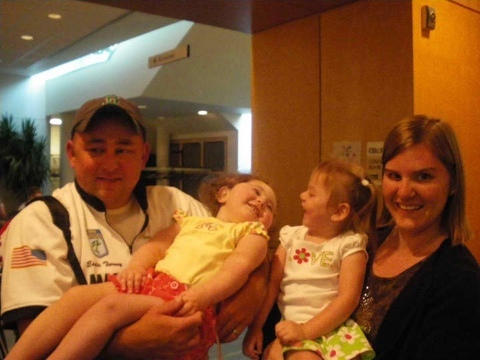 If there is a will, there is a way | Families for HoPE, Inc.
Hi my name is Molly Johnson, and I want to tell everyone a story about how my family, husband Jason, daughter Marissa and my mom Pat, all made it to the 2010 Conference on Holoprosencephaly in Maryland. 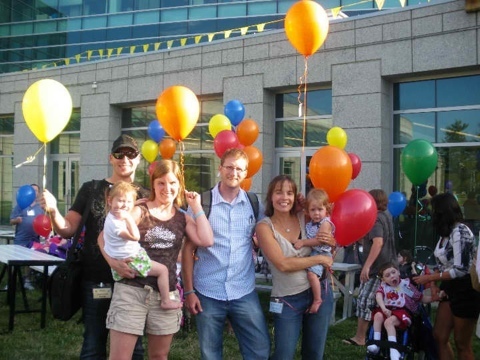 We live in Washington state, and we had never met or talked with any family who has a child with HPE. Because I was hoping to find a doctor who had seen, studied or worked with kids who have HPE, I contacted Nancy Clegg at the Carter Centers for Brain Research in Holoprosencephaly. She told me that in July 2010 Families for HoPE and the National Institute for Health would be holding a conference, and there would be doctors and other HPE families there. She asked if we thought we could attend. I wasn’t sure, but I had HoPE. I quickly called Jason to tell him about the conference. I told him that we needed to go and was going to find a way to pay for it. And I did! For Marissa’s 2nd birthday, I asked for money for the trip instead of gifts, and that provided about $500 from family and friends. I held a yard sale, and friends and family donated items. At the sale, I shared Marissa’s story with shoppers and explained that the money raised would help fund our trip to the conference. The people were so nice, and many of them donated more than what they would normally pay for garage sale merchandise because they knew what we were planning on doing with the money. We raised $800 from the yard sale. When I told Marissa’s pediatrician about the conference and told him we were raising money to attend, he talked to someone at the hospital. I learned that some hospitals will give families money to go to conferences where the family can learn more about treatments, therapies, and caring for their child with a medical condition. We were awarded $500 from the hospital. I told Marissa’s early intervention therapists about the conference, and I discovered that EI services in my state has a fund to help parents attend classes or conferences related to their child’s condition. This earned us $200. Because we were willing to share Marissa’s story and raise awareness about HPE, we were invited to speak to two different community service clubs in our town. Kiwanis and Rotary provided a combined total of $800. Most service organizations were established as a way to help families in need. With all the work, I accomplished my goal of ensuring that my family would not miss this once in a lifetime opportunity to seek answers, insight, and advise to better support and care for Marissa. We even were able to spend some of our time and do a little sight-seeing in our nation’s Capitol. And, the best part is that we even had some money left over, and I’ve saved it to use it for attending the 2012 conference in North Carolina. If you have a will to attend the 2012 conference, you can find a way. I say start now because it will be here sooner than it seems. So far, I have had a yard sale already this summer, and for Christmas and Marissa’s 4th Birthday, I am asking again for money for this trip. The greatest thing we learned is that many organizations (hospitals, early intervention, and community clubs) have money set aside for special needs families who have a need. You simply need to ask. I figure if you really want something bad enough, you will find a way to make it happen! I did, and I am so glad we got to meet so many wonderful HPE families face to face.